Eurocom is offering customers $100 off of a selection of exciting notebooks, the Shark 2.0, Electra and Monster. The EUROCOM Electra, Shark 2.0 and Monster are all small, mobile yet still very capable and performance oriented systems that would make the perfect Christmas gift for a friend, family member or a special gift for yourself. To qualify, the order must be for a configured system. Discounts cannot be combined. The $100 off Cyber Monday discount is valid until Monday, December 2, 2013 until the end of the day. Select Systems for Cyber Monday Savings! The 15.6” EUROCOM Shark 2.0 is a high performance gaming system with NVIDIA GeForce GTX 765M graphics and 4th Generation Intel Core i5 and i7 processors. EUROCOM Shark 2.0 provides high-calibre performance, powerful graphics capabilities and high performance storage with four physical storage drives and RAID 0/1/5 capability. Super powerful Intel Core processors are supported for high-end computing wherever life takes place. The Shark 2.0, which measures 14.96" x 10" x 1.61" and weights just 5.9 lbs, also supplies tremendous SATA-3 storage allowing users to save more of their favourite photos, music, games, and more, as well as headroom to install additional office and entertainment applications. 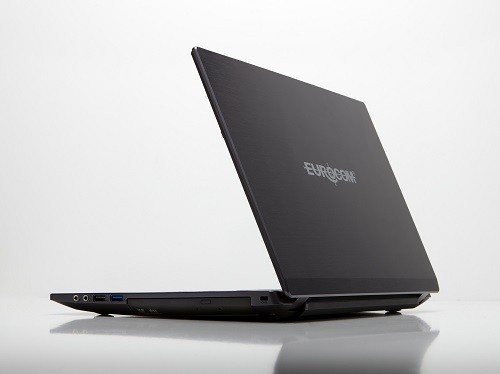 A thin and light 15.6” system with great 7 hour battery life and a beautiful IPS display the EUROCOM Electra is perfect for on to go users. The EUROCOM Electra is a thin and light notebook with the power to play games, and the refined design to take to the boardroom or on the road to a conference. The NVIDIA GeForce GT 750M graphics card has 384 CUDA cores running at 967 MHz with 2 GB GDDR3 memory running at 1000 MHz with Optimus Technology for graphics performance when you want it and long battery life when you don’t. For users who require substantial amount of storage, the Electra has support for three storage drives, with one mSATA, one 9.5mm standard drive bay and the third taking the place of the optical drive. A total of 2.48 TB of storage is currently offered. An 11.6” tiny little powerhouse with great battery life. The EUROCOM Monster 1.0 provides gaming on the go graphics capabilities and high performance storage in an extremely small, under 4 pounds, lightweight notebook computer. This little Monster has the power of a full sized notebook, and has up to 410 minutes of battery life, it’s truly the best of both worlds.